Discover why relaxing at our amazing beach and waterpark is one of the most romantic things to do in Cozumel, on Valentine's Day or any time of the year. Will you "Beach My Valentine?" Beaches are made for romance - and our incredible beach and water park is the perfect destination for a couple's getaway in Cozumel. 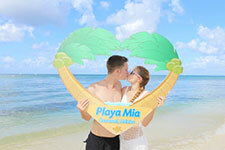 Discover all the romantic things to do at Playa Mia Grand Beach. Long walks on the beach. Fun in the water. Island adventures. Find all the elements of romance when you spend the day at Playa Mia Grand Beach and Water Park. With picture-perfect white sand beaches and endless activities, our coastal getaway is an ideal destination where couples can escape.